Here is the Canadian version of AN ECHO IN THE BONE. The cover is identical to the U.S. edition, but the Canadian edition has a different publisher. Yes, that's the Orion hardcover. It'll be available in Australia and New Zealand on Sept. 22nd, and sometime in January in the UK. For those of you in the UK who are wondering why you have to wait until January to get the book in hardcover, look here for Diana's explanation, and here for details of a special offer for UK readers that will enable you to get a FREE paperback copy of the book when it's released in September. Finally, here is the cover of the German edition, titled ECHO DER HOFFNUNG (which, I am told -- I don't speak German <g> -- means "Echo of Hope"). Barbara Schnell, Diana's German translator, is hard at work on her own version of a Final Frenzy at the moment, trying to meet the deadline for a November 27th release of the German edition. If anybody has any further information on international editions, please post a comment here. Thanks! UPDATE 8/16/2009 2:38 pm: I just discovered Carmen's extensive collection of international covers for Diana's previous books. Look here to see the picture gallery. Very interesting site, which I have added to my "OUTLANDER Links" list. Great job, Carmen, and thanks for putting that together! So FYI, an Dutch edition will also be out in November. 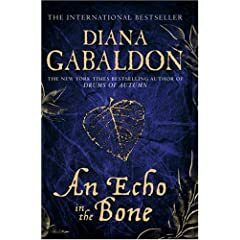 The title - Een Echo in de Tijd - means something like Echo through time and the cover looks like the one from the UK edition. You are also right about the translation of the German title. Oh im so glad the Aussie dates are still in September, i would have hated waiting until January like the UK readers! I bought this yesterday after reading your posts about it. Looking forward to starting it today. Very informative blog you have!